University of Chicago graduate student, John Santerre (right) practices approaching a trauma wound victim and assessing their condition. Inspired by the disproportionate distribution of trauma centers in Chicago, community groups Ujimaa Medics and the Northwestern Trauma and Surgical Initiative are both providing ordinary Chicago citizens the knowledge and the training to save lives through first responder courses. These groups offer courses designed to teach participants basic skills to assist trauma wound victims on the scene of an incident and improve the patient’s chances of recovery. Throughout the courses participants learn how to make tourniquets out of everyday items, how to asses a scene for safety, how to reduce bleeding by applying pressure to wounds and a number of other first responder techniques. 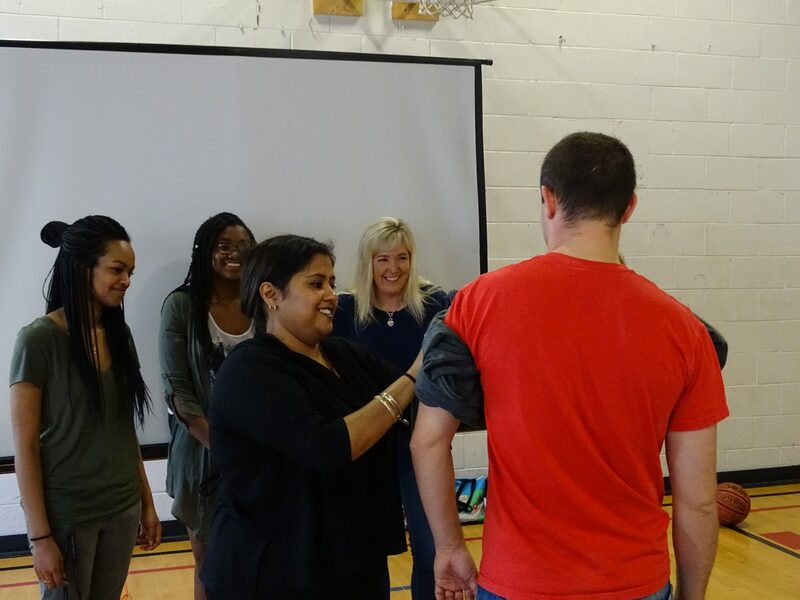 Founder and proctor of the Northwest Trauma and Surgical Initiative, Dr. Mamta Swaroop, demonstrates how to tie a tourniquet using a scarf to a first responder trauma group. Photo by Connor Carynski. The Chicago South Side Trauma First Responders Course (CCSTFRC), a curriculum operated under the NTSI, was founded in January by Dr. Mamta Swaroop, an associate professor at the Feinberg School of Medicine at Northwestern University, to provide the South Side community with training and resources to potentially improve the outcomes of trauma wound victims. John Santerre, graduate student at the University of Chicago and attendee of a May, 28 trauma course said he has been on the scene of several shootings in Hyde Park and wanted to be able to assist individuals with traumatic injuries. One portion of the course he said was particularly useful was learning how to handle the emotions of family members and friends when their loved ones have been injured. “The information that is conveyed in just three hours and how people could respond differently to a scene as a result creates a significant effect on the community,” Santerre said. Nedelina Teneva (left), University of Chicago graduate student, is shown how to properly move a trauma victim in a way that reduces the risk of spinal damage. Photo by Connor Carynski. To date, the CCSTFRC has been taught to over sixty people, some of whom have called to tell group members that they were able to use skills they were taught in the course, according to Leah Tatebe, CSSTFRC Program director and adjunct professor of surgery at Northwestern University. Tatebe said people are often brought to the Northwestern Hospital trauma center with non-life threatening injuries but have lost too much blood during EMS transport for doctors to be able to help much. In a collaborative study conducted by members of the Department of Surgery at the Northwestern University Feinberg School of Medicine and the Department of Emergency Medicine at the University of California in San Francisco, researchers found that Chicago’s geographical disproportionate distribution of trauma centers have created areas that receive different access to the facilities than others. The same study concluded that the less time it takes to transport a trauma victim to a trauma center, the better the outcome of the individual. “My interest is in not only in advocating to try to get the appropriate equipment out to this area but in the mean time trying to do what we can to bridge and triage the issues and train people to use very simple materials to be able to control the bleeding,” Tatebe said. 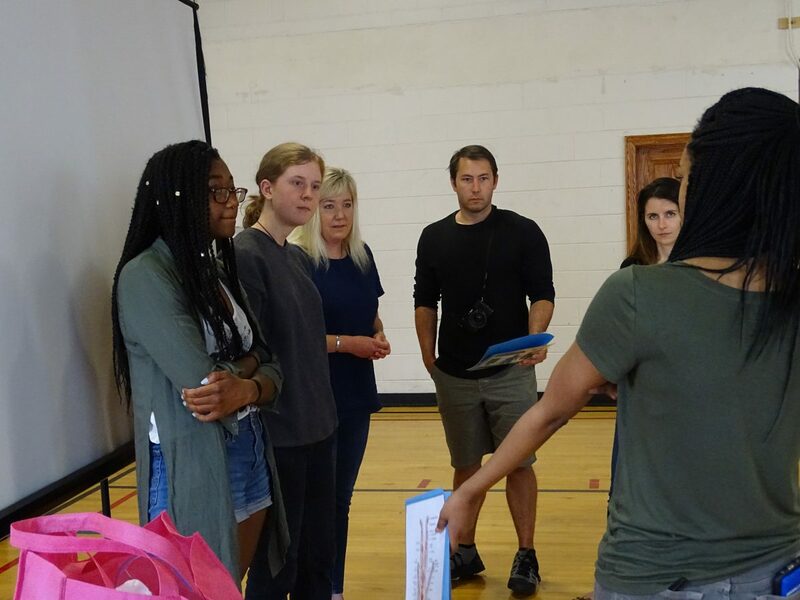 Titania Wondimu (far right), a Northwestern graduate student and Chicago South Side Trauma First Responder Course volunteer, teaches a group about controlling the bleeding of trauma wounds during a May 28, course at the Golgotha Romanian Pentecostal Church in Oak Lawn. Photo by Connor Carynski. Public attention was drawn to the geographical disproportionate access to trauma centers in 2010 after the death of 18-year-old Damian Turner, who was shot four blocks away from the U. of C. Medical Center in Hyde Park but was instead rushed nine miles north to Northwestern Memorial Hospital, according to a 2010 New York Times article. Turner’s death sparked a number of demonstrations demanding that U. of C. create a trauma center which would be accessible to south side communities. The University of Chicago Medicine announced Dec. 17, 2015, plans to create a level 1 trauma center in its Hyde Park campus but the center is not planned to open until January 2018. Amika Tendaji, co-founder of the Ujimaa Medics group, said Tuner’s death was one of the reasons she and other community leaders wanted to create the program. She added that there needed to be something civilians could do on the scene of a traumatic injury because they are typically the first ones to encounter a victim. “The goal is really to take medicine out of its silo and give that knowledge to the people that need it,” Tendaji said. Ujimaa Medics is a volunteer group that offers courses to the public and to private organizations on scene safety, effectively communicating with 911 dispatchers and how to transition care to EMS personnel when they arrive on the scene. The group also aims to provide information about non-violent situations require immediate attention such as asthma attacks in hopes to fight perceptions of violence in the communities they serve. “It’s a tough balance. Chicago is a city that has a lot of violence and so you have to address that in whatever way you can but you also don’t want to think only in terms of violence,” Tendaji said. Though violence contributes to a great deal of traumatic injuries in Chicago, Tatebe said the first-responder course incorporates skills that are useful for non-violent traumatic injuries like what might occur in a car accident.